A Model 3 P100D would be as comfortable as an electric blanket and as menacing as a taser. When the upcoming Tesla Model 3 was advertised as the electric equivalent of the BMW 3 Series, the gears in our minds began turning, envisioning the possibility of a high performance variant that could take the fight to the M3. While we have no doubt that Elon Musk will find some way to cram Ludicrous Mode into a highly appetizing Model 3, we can now confirm that the 100 kWh battery from the upper echelons of Model X and Model S trim will not make it into the smaller sedan. A recent Tweet by Musk is what broke the news when, we presume, a potential Model S customer asked the Tesla and Space X CEO if a P100D version of the sedan would be upgradable to 110 kWh when it comes out (note: Musk or Tesla have announced no such 110 kWh Tesla). Musk responded by saying, “No plans to take X, S (or 3) above 100 kWh. Semi necessarily and pickup truck maybe will go above.” One piece of news we can garner from this announcement is in regards to the proposed Tesla pickup truck and semi truck. It’s obvious that a semi-truck might get a larger battery to help it accommodate for the weight of the cargo it’s expected to carry as well as the long distance driving required to deliver goods. A pickup truck would gain the same benefits but will need them to a lesser extent, but both vehicles would be large enough to accommodate for the extra batteries. However, the Internet decided to try and read between the lines of Musk’s tweet, with user @jovanik21 asking Musk, “did you just drop a hint that 3 will have 100kWh?? ?” That’s where the CEO crushed our hopes and dreams with a single line, stating “No, will be lower. 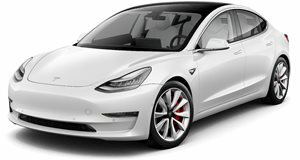 Wheelbase can't fit 100.” While this may sound like disappointing news, there’s a silver lining to be seen because it means the Model 3 may just stick to a more reasonable weight that will make it better in the corners. You’ve gotten your cake, but how does it taste now that you’re eating it too?